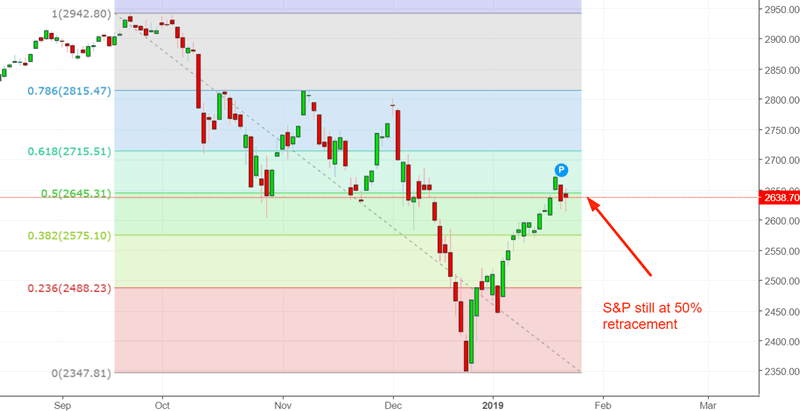 With the stock market stuck at its 50% fibonacci retracement, many traders are looking for a pullback/retest. While the Q4 2018 stock market decline coincided with a flat U.S. Dollar, there’s a high probability that the next pullback/retest will coincide with a falling U.S. Dollar. Macro data remains limited due to the ongoing government shutdown. But with the macro data that is available, macro is mixed-to-weak. Here’s the Chemicals Activity Barometer, a semi-useful leading indicator for the U.S. stock market. *From Bill McBride at Calculated Risk, one of the few good economists. As you can see, the Chemical Activity Barometer is dropping sharply right now. 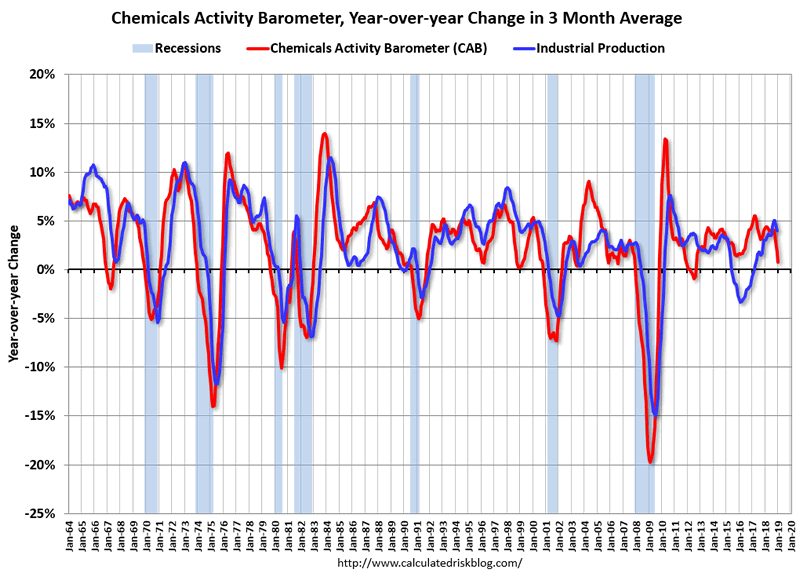 Should this continue, the Chemical Actiity Barometer’s year-over-year change in 3 month moving average will turn negative for the first time since 2012. 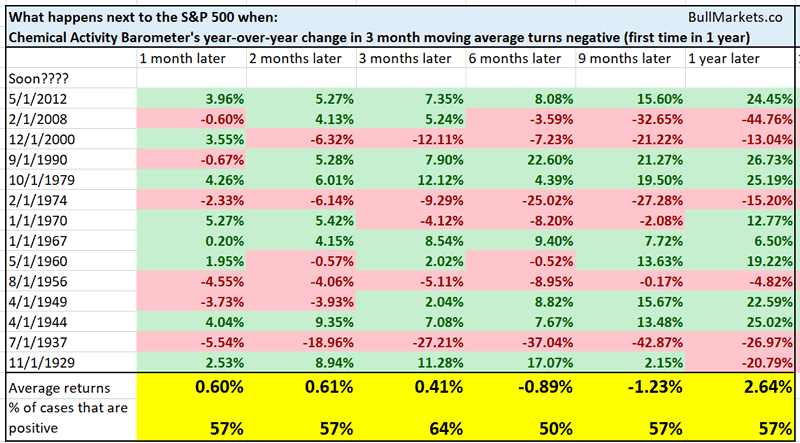 Here’s what happens next to the S&P 500 when the Chemical Actiity Barometer’s year-over-year change in 3 month moving average turns negative for the first time in 1 year. As you can see, forward returns aren’t terrific. Although this indicator does have some false signals (e.g. 2012), a negative reading usually precedes a recession. Recession + high valuations (e.g. right now) = much bigger decline in the S&P 500. This isn’t a long term bearish sign for the U.S. stock market right now, but will be soon if this indicator turns negative. The S&P 500 is holding above its 50 day moving average. Is this a “sustained breakout”? As you can see, there’s a strong tendency for the stock market to fall over the next 2-3 months. Why? When the S&P is below its 50 dma for 3 consecutive months, it means that the S&P has been in a long and persistent downtrend. As we’ve shown in the past, sharp downtrends are usually followed by a bounce to the 50% retracement, and then a pullback/retest. 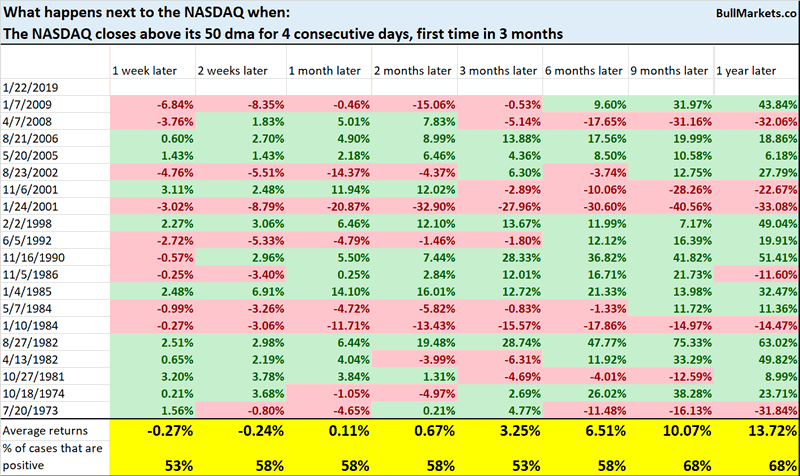 Like the S&P the NASDAQ has closed above its 50 dma for 4 consecutive days, for the first time in 3 months. Here are similar cases, and what the NASDAQ did next. As you can see, the NASDAQ’s forward returns are mostly random. So why isn’t this as bearish for the NASDAQ as it is for the S&P 500? The NASDAQ’s price action is a little different from the S&P 500. The NASDAQ (and the Russell 2000) tend to go up and down in straight lines more often than the S&P 500 does. After breaking out above its 200 dma, silver has once again broken below this moving average. Gold and silver experienced very long and sustained downtrends from June-November 2018. A few months ago I said that “although gold and silver will make an oversold rally soon, that rally will not be sustained. Such long precious metals downtrends ARE NOT characteristic of gold and silver bull markets”. Here’s what happens next to silver when silver rises above its 200 dma for the first time in half a year (e.g. December 2018), and then falls below its 200 dma within 1 month (e.g. right now). As you can see, silver’s forward returns are not good. Here’s the same study, but applied to gold. Gold’s forward returns aren’t good either. While the U.S. stock market experienced massive volatility in Q4 2018, the U.S. Dollar Index went nowhere. This is uncommon, because the USD often either spikes when the stock market tanks, or falls along with the stock market. 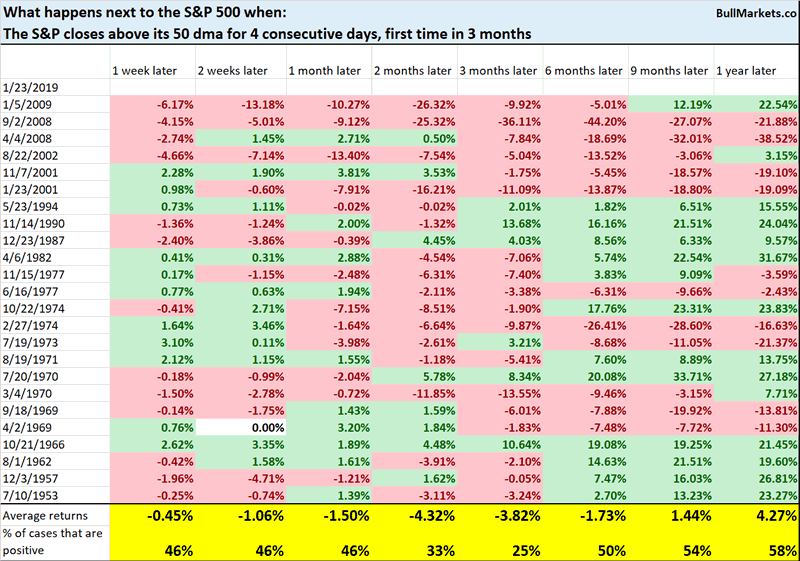 Here’s what happens next to the S&P 500 when the S&P witnesses at least 33 1% moves in the past 70 days, while the USD Index is within 1% (up or down) of where it was 70 days ago. 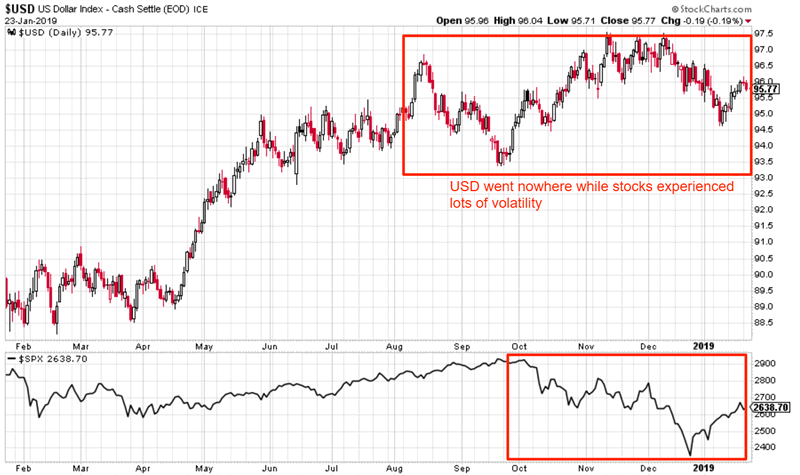 However, this is a bearish factor for the USD over the next 2-3 months. Perhaps the stock market will pullback/retest and the USD will fall at the same time?